The pressure is on! Tomorrow is the first day of the Vancouver One of a Kind Show & Sale and there is all kinds of prep work that needs to be done. Walls are painted, shelves are installed, cards & birthday calendars are packaged up but there’s also carpet and under pad to be laid, furniture to be set up and then just the general nervousness that comes with a big event. Let’s just say that it’s a soup kind of week. Earlier , when my thoughts were still about what to eat for dinner than the panicky thoughts that are filling my brain at the moment, I roasted up some tomatoes, garlic, herbs and jalapeno peppers. At that point, I wasn’t sure what I was going to make. A pasta dish maybe? But it had been a while since I had made soup, and when that thought entered my head, I just couldn’t shake it. Into a stock pot these fragrant tomatoes and peppers went, along with some onions and celery for balance, some homemade stock and a can of black beans. A squeeze of lime near the end also didn’t do this recipe any harm either. For the recipe, please head on over to Poppytalk. So wish me well at the sale if you are from out of town, but if you are in Vancouver tomorrow until Sunday, please stop by our booth (we’ll be at booth G18: The Hob Snobs Craft Collective). 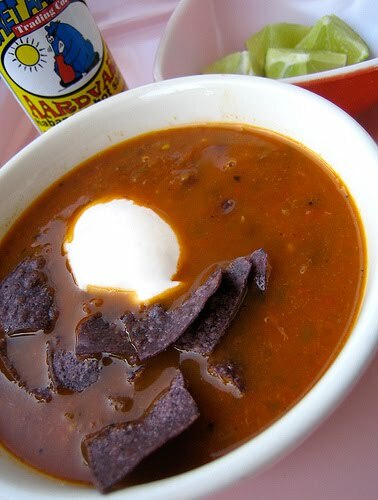 I’ll be the nervous red-head wishing she had a bit of spicy soup to help calm her nerves. What kind of stock did you use in this soup? 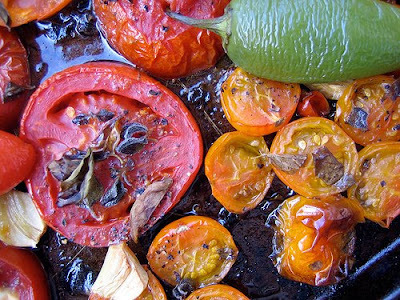 Those roasted tomatoes look absolutely delicious, as does the soup. Perfect for cold weather. Good luck with the show… I will try and stop by. The roasted things look so good! Hey nervous redhead…good luck with the show and above all…have fun!! I wonder if lentils would work in this soup because that's all I have in stock right now. Dammit, I work! I would have loved to come by. This soup sounds and looks heavenly in this cold weather. 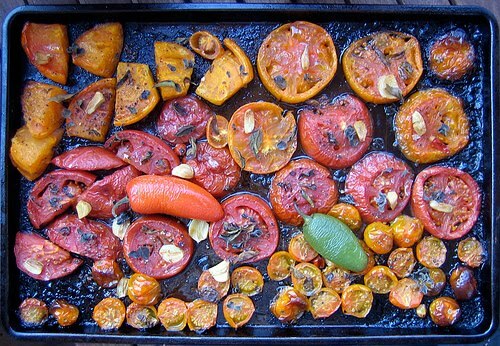 Beautiful – I LOVE the pic of the roasting tomatoes! Thanks Sarena, I hope you make a potful soon! Aw, I'm sure I'll meet you soon Amanda! Got Craft maybe? ShyGuy, I used a homemade veggie stock "enhanced" with a bullion cube, but any kind of stock would be great. Hag, I hope so! It's been ages since we've met up. Bijoux, lentils would be just fine here. Try it and let me know. Thanks CookiePie! I love that shot too…so colourful. I was just lamenting the distance between me and my immersion blender (not that it would actually work in Geneva) and then this. Jeesh. This soup looks and sounds delicious. When I'm back in Vancouver in January and reunited with my blender we're gonna have a hot soup date. PS Good luck in your booth this weekend! Good luck! You will do great, especially with this soup to fuel you. Just sneak the patrons some of this (aka bribe them) and they won't be able to resist! Wishing you well! Let us know how it goes. With all the eating this Thanksgiving weekend, I love the thought of something spicy to balance the richness. Best of luck with the show! I hope it was a terrific weekend for you! I wish I could have been there to buy! Mmm all those roasted vegetables look so good! Hope the one of a kind show/sale went well! That roasting pan picture is like a painting! Brie, I'm sure with this soup, you could just use a potato masher! Don't give up soup hope! I wish it would be that easy, Joanne! Thanks Lindsay, the photos turned out really well. Tara, my holiday dinner was pretty meager (too tired to cook! ), but this would make me happy anyday. Thanks Dana! Don't worry, I'm sure we'll meet up soon. Thanks Deena, I was pretty happy the photos turned out as nice as they did! Would this work if I have green tomatoes? Hmmm……. hmmm, kevin, not sure about the green tomatoes but that's only because i've never cooked with green tomatoes! try it and let me know. i made this on friday night with the backlog of romas i've been getting from spud. i got through two of the 4 bags. it is a wonderful soup. thanks. I'm making this soup right now! Allison, glad you loved the soup! Carly, I tweak every recipe. Hope you love it!